Need the simplicity and familiarity of standards plus the file storage performance and scale to meet your HPC requirements? Watch this webcast to learn how you can achieve multi-petabyte scale and the highest NAS performance while using standards. BlueArc is known for delivering file storage at scale by innovating with standards and adding features typically found in enterprise class file storage solutions. The company delivers the industry-leading file storage solutions at scale with NFS, CIFS and iSCSI today and is adding pNFS in the near future. Effective high-volume media transformation pipelines require an automated transcoding solution that can quickly, efficiently and concurrently transcode source content into all required output formats for supporting the vast array of viewing devices (and other applications such as deep archive) and all at the maximum possible visual quality that major media organizations demand to protect their brand image. The solution must also scale seamlessly as content volumes continue to grow, allowing additional transcoding nodes to be added without interruption to existing operations. The transcoding solution must be supported by a high-performance storage platform that is up to the task of handling many concurrent input and output operations from multiple transcoding nodes with varying data profiles—extremely large sizes for individual source files, but each resulting in multiple—even dozens—of concurrent but much smaller outputs. Watch this 20 minute webcast to learn the significance of trancoding in Media and Entertainment workflows and the important role that high performance storage plays in transforming and distributing high quality content to reach consumers on a constantly growing range of diverse delivery platforms from Blu-ray Discs to iPads, iPhones and Internet-enabled TVs. Lighting fast storage is an accelerator to driving great visual results. To meet aggressive production schedules, media companies are transforming virtually every stage of the content creation process, from media acquisition, encoding post-production, file delivery and archive. In order to fully realize the promise of these new file-based workflows, a highly-scalable and flexible technologies are needed to store, transform, exchange and distribute massive volumes of digital media content at global distances quickly, reliably, and securely. BlueArc and Aspera, Inc. develop breakthrough technologies that achieve optimal efficiency and performance which can translate into tremendous cost savings for the enterprise. In any production schedule, time is the most valuable asset – the backbone of file-based workflows is the predictability and availability of resources. To achieve both, the performance and utilization of infrastructure becomes a gating factor. This webinar focuses on two infrastructure aspects, storage and data access. 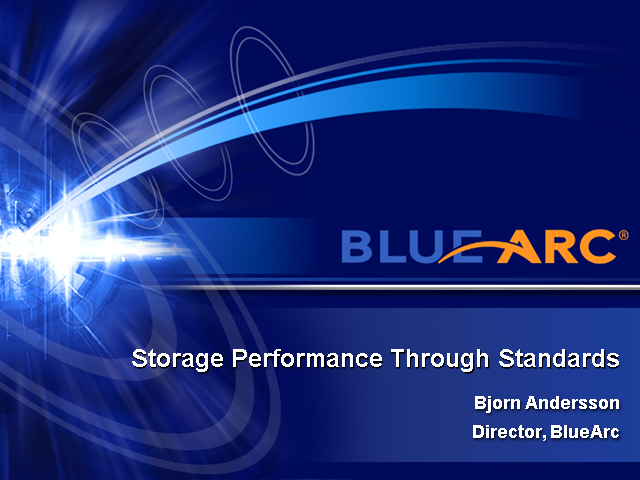 BlueArc partners with customers to solve their storage and data management-related business challenges. BlueArc’s best-of-breed, high-performance, highly scalable and cost-effective storage solutions help to accelerate our customers' success.